ISLAMABAD: An exhibition titled, “Yak Baloch Kahol e Hashar” by Baloch artist Akram Dost Baloch opens on Thursday at Gallery6. Baloch, born in Nushki in 1958, vibrantly brings out Balochistan’s art and craft which is well-known for its vibrant colours, motifs and designs. “I still can’t get out of these traditional motives, designs, rhythms and colours that are very different, distinct, and indigenous. Natural dyes used in handlooms, well-crafted threadwork, adorning carpets have all been my inspiration. It becomes evident that my artwork is linked deeply to my land, my region, my culture and not just represents a school of thought,” the artist said. The talent for painting has been running in the family through generations. Akram’s uncle Asmatullah also used to paint and even made Mona Lisa wearing a Balochi dress.. Motivated by his carpet weaver, Baloch joined NCA, Lahore in 1978, from where he graduated in 1983, with a major in painting. However, he works in different mediums and in this exhibition, besides his two distinct styles in paintings, there are unique two carved wooden suitcases that were used by pre-partition British Army soldiers and also a 3-panel wooden carved painted screen. His continued success and progress with different mediums in art led him to become the Head of Department of Fine Arts in University of Balochistan (UoB), Quetta. His brother Jamil Baloch was next to follow the path laid by him. Jamil started as a landscape painter but has become a leading sculptor of the country after graduating from NCA in 1997 and now teaching the subject at the varsity. The third brother, Faheem Baloch, was next to graduate with a BA in Fine Arts (BFA) in 2004, which he acquired from UoB. 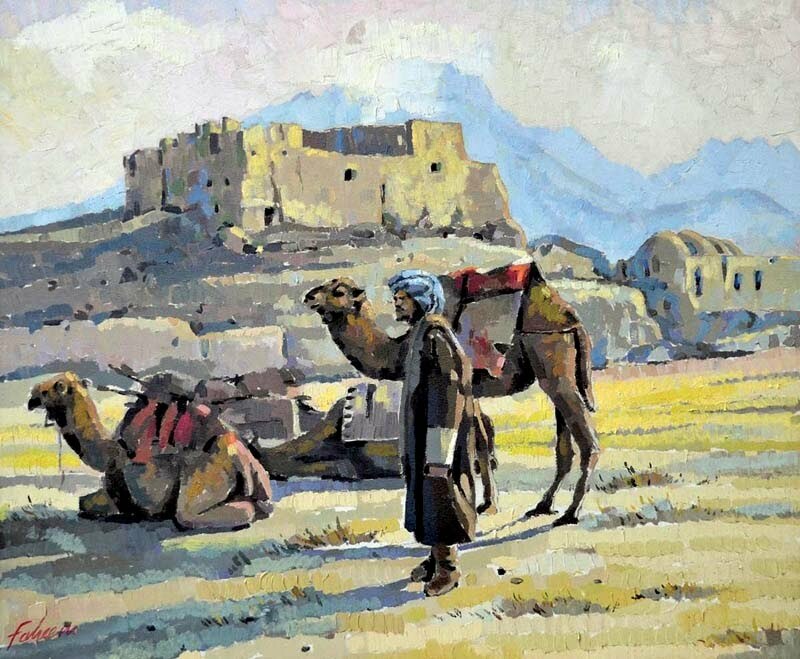 Balochistan has many deserts, dry lands and mountain areas, which have been an inspiration for artists and this scenery, became Faheem’s inspiration too. However, he not only does landscapes but also makes sculptures and does wood carvings with figurative works. Jabal Baloch, son of the fourth brother Dr Sarfaraz Baloch, was the fourth individual to join the family art group with a BFA in Fine Arts from UoB in 2012. He mainly dwells in figurative paintings that are included in the show. Saud Baloch and Rahim Baloch (both sons of Akram’s cousins), started their studies from UoB, but moved to NCA after completing the third year in Quetta. The family art tree further expanded when Jamil married Mary who along with Doda Baloch (Akram Dost Baloch’s sister) also joined the line of artists. Soon to join this unique family group will be Dostak Baloch (Akram’s son) and Mahzeb (Doda’s sister). Both of them are currently studying at NCA. In 2015, the family will be initiating 2-year diploma courses in Fine Arts, in Quetta. The building for this institute has been completed and the NCA, Lahore course will be followed. The exhibition will continue till May 2 2015. Published in The Express Tribune, April 23rd, 2015.